NOTE: This has been sitting as an almost-complete draft since June…going to drop this one here and get on to the present! Race morning began much the same as it did last year: shuttle van from the hotel to Boston Common, shuttle school bus from Boston Common to Hopkinton. Unlike last year, I knew no one on either shuttle, so I ended up talking about running and the Boston Marathon in general with two middle-aged men who had each ran Boston at least ten times, which made for interesting conversation. I did most of the listening. It was quite nice to be inside a vehicle for as long as possible because…it was going to rain. It was all anyone could talk about at first, yet it was what no one wanted to talk about. The sky was overcast but not dark, and I still believed there to be hope in the rain holding out, or at least keeping to a minimum. The rain got worse. I found a dry spot in a white tent in Athlete’s Village and huddled there…for two hours. It was a long two hours, let me tell you. I was desperately looking around for someone I knew, because I’d rather talk for two hours to shake away my own thoughts, but I knew it would be best to stay out and remain somewhat dry and warm. So, i sat/laid down for two hours, taking in some calories and water periodically. Finally it was time to leave, but we just walked down to the next area before the start, where we did more waiting. It was very different from last year. I somehow missed the announcement about my corral walking to the start despite all the waiting, so I had to run and jump into the back of the corral. I didn’t realize this until hours after the race, but my watch didn’t even have a satellite yet, so it was just estimating my first five miles based on cadence (I think). Oops. I knew starting at about 9:00 that I did not feel 100%. Aside from my feet being absolutely numb from being damp and cold, acid reflux had started growling in my chest. I may have mentioned it a few times before, but I have been having major issues with this off and on for the past seven years. I have suspected a hiatal hernia, but then I always equate it to stress and stop running at night and it goes away. Regardless, it was happening at the start. The start of the Boston Marathon. It has never affected me in a morning race from the very beginning, so I was terrified starting this race. I have turned back after two miles on normal training runs due to this problem. 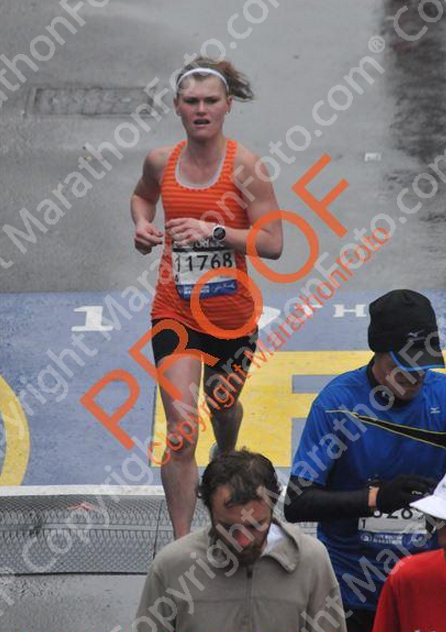 This was the Boston Marathon. My pace hovered in the 7:30s and 7:40s for awhile. My legs didn’t really want to go faster and my chest was getting tighter and tighter. Not good. During mile six I decided I really needed to pee and it would change my life if I stopped to do so. Yes, mile six at Boston I went into a porta potty just to pee. Who does that? The good news: I have a new bathroom PR. I think I ran around 7:22. Eventually I recognized that my legs did in fact feel pretty good, so I tried desperately to focus on that fact and not the awful feeling in my chest I had felt so many times before. I tried two times to make small talk with runners around me and failed. Before Wellesley, there was a poster stuck to a telephone pole that read: “Congrats [name], you’re halfway there!” I said, “I don’t like that poster!” jokingly, since we were running the eleventh mile…hardly halfway in a marathon! The guy next to me just replied, “Well, don’t believe everything you read” not in a very amicable tone. What? Okay. I passed him and moved along. This was somewhere mid-race; my soaked cotton gloves were still on. I did not dress (actually, pack) properly for this race, even by my standards. Until I decided to go to the bathroom again in the next mile. Come on Meghan, I scolded myself. Really? Twice for non-emergencies? Despite feeling like I never wanted to ingest anything in the near future, I stuck with my plan. I was not about to feel like this and bonk. At least leave me a little hope, body. I had Gatorade at every water stop except for the ones I just didn’t feel like grabbing anything (just a couple) until mile 18 or so, and had gels about 60 minutes in and at mile 14. Let’s just say I did not look forward to them. During and after Heartbreak Hill, I ditched the half of the PowerGel I picked up and switched to water. At some point near Heartbreak, some people were under a tent blasting the song “No Place I’d Rather Be” by Clean Bandit. When the song came out months before, I remembered liking the beat and all, but like so many other songs about love and relationships, not loving it because I couldn’t relate to the lyrics. Now that it was playing during the race, I made it context appropriate and just adapted it to being about running. I was certainly feeling “a thousand miles from comfort,” dry-heaving every five minutes, wondering if or when my quads would die, and getting totally pounded by the rain. Playing the chorus repeatedly in my head the rest of the race, I took consolation in reminding myself I loved running and I trained hard for this, therefore this will be fine. There is no place I’d rather be. It was a little comical, thinking back at the scene, how the lyrics contrasted the race. And also they might have simultaneously fit. Desperately searching for my family to have something to look forward to…surprised I didn’t have a sore neck, after looking at this picture! From mile 20 to 22, I desperately searched for my family. The same crew was all back again: my mom, dad, two youngest brothers, and my grandmother, who was never a runner but is the biggest track and marathon fangirl you ever did see. I needed something else to focus on. They ended up getting to their spot just in time from the T, around mile 22.5. It worked out that they were farther up than I thought, because it got me through the hills on a mission. Something else happened right after Heartbreak…I started to feel better. I was no longer dry heaving out of necessity every five minutes (half Ironman deja-vu but I didn’t stop…oh wait I didn’t write about that…). The best part: my legs were fine. I was a little nervous my glutes were about to lock up like my quads did last year after Heartbreak on the downhill, but they stayed in check. So, the game changed. 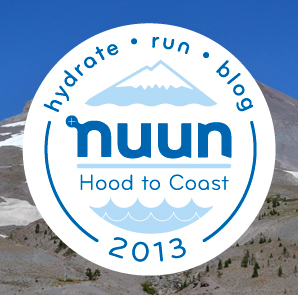 No more acid reflux/dry-heaving awfulness + relatively fresh-feeling legs = go time. I waited twenty-one miles to start running the marathon I knew I could run. Not what I expected, but I’d take it over the whole thing falling apart. It still could, I thought. But let’s run with this feeling and see what happens. Suddenly, everyone running in front of me was in my way. This was a stark contrast to the year before, when I felt like I wasn’t moving at all and was utterly jealous of how fast others could manage to move. I figured that if I could keep up the increased pace through the finish, I could still break 3:20. I saw Steve cheering with his friends at mile 24.5 for another boost, and kept rolling to Boylston St. 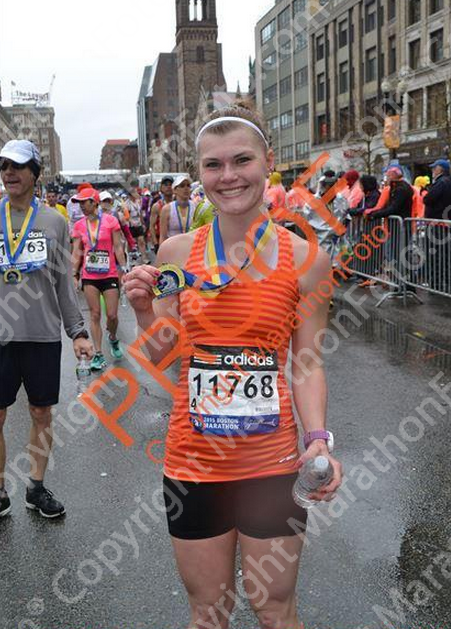 It was a great feeling to finish feeling relatively strong at Boston, but the rain and the smaller crowds still made Boston 2014 a happier moment in my book. Not to mention the hypothermia after the race due to not getting warm clothes until over an hour after I stopped moving. I won’t write much about that. Shivering in damp, tight clothes after running 26.2 miles was truly awful. I promised myself to do bag check next time, regardless of the weather. I ended up finishing in 3:19:28, which was a two minute, thirteen second PR from the previous year. But, I had trained harder and I was stronger, and I knew had I not felt so sick I would have run much faster. The main reason I wasn’t pleased with the race, though, was that I didn’t have fun. I wanted to have fun, and I tried, I really did! But I didn’t have fun. The acid reflux felt horrible – as in, if it was a normal run I would have had to lay down for hours to feel better, yet it was during a marathon. Even when I tried to focus on my legs and the atmosphere, people around me were negative. When I did in fact finish strong, I immediately went into survival mode from the cold rain and nearly forgot all about it. My family was slow to get to me, and then plans were complicated after and I didn’t even have a place to take a shower, all the while feeling nauseous. I really tried to have fun. Sometimes, it doesn’t work. Faking it. Though I guess I was happy in between finishing and getting cold – short window! So that was that, Boston 2015. 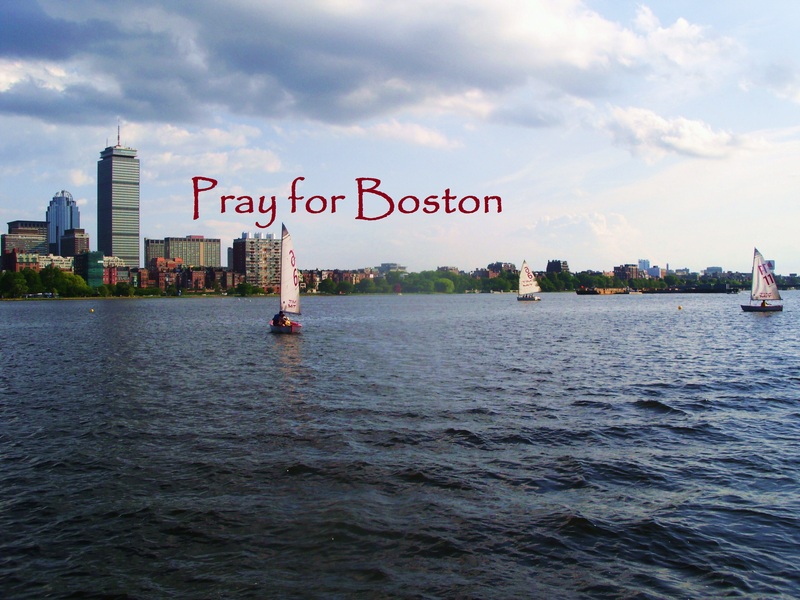 It has been quite a few days since I last blogged, and since I returned from Boston. I have told and retold the story of my experience numerous times, to friends in person, via text messages, Facebook, and over the phone. Each time it feels the same; the facts are still the same, the outcome was still the same, it is still as horrible as it was the day it happened. Being so involved in the running community, even at work, means there isn’t an hour that passes during which it isn’t brought up, either in my mind or out loud. I’ve read some other bloggers’ accounts of the afternoon; here is mine. I woke up excited as ever to spectate my aunt and friends. I had stayed at the Sheraton the night before, and so I checked my bags downstairs and headed out with all my cheering essentials: water, Nuun, camera, phone, money for the T if I chose to ride it. I walked down Boylston to view the finish line, and snapped some photos of the colorful flags flapping in the early morning breeze. Having walked down to Brookline to cheer on Commonwealth last year, I decided to switch it up and ride the T out to a farther spot. First, I rode out to mile 18, miscommunicating with Nick and thinking he was headed there. He was actually at Boston College, but my stop at mile 18 wasn’t for nothing – I was able to snag a couple free cowbells, watch part of the “erg marathon” that was happening, and get pumped up from the music coming from the big PowerBar station. I was getting into the mood; it was going to be a great day to be in Boston. 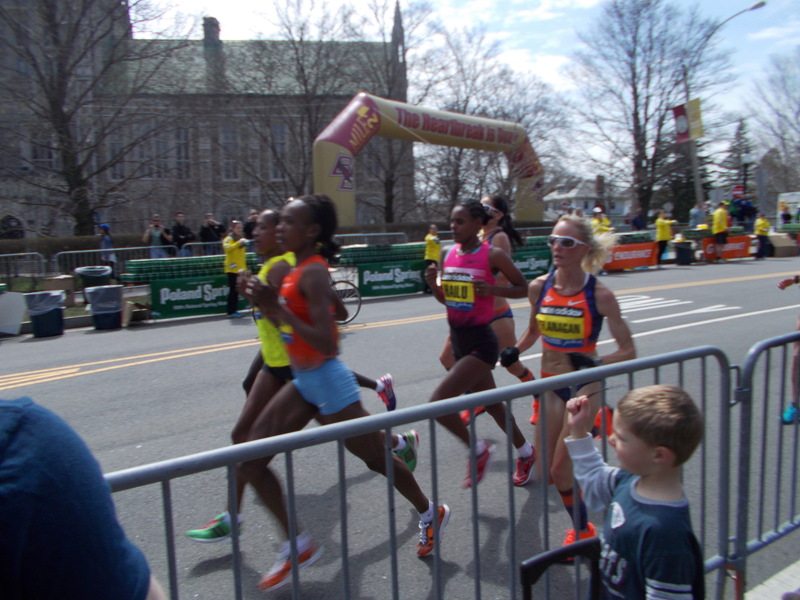 Elite women after Heartbreak Hill. iconic landmark of the course. I must say, that stretch of road is beautiful. If it wasn’t at such a painful part of the race I’m sure it would make for a great section of an ordinary run! Then…I went camera crazy. I was looking out for a lot of people, and I hardly managed to take photos of the people I actually knew. My logic was that I would look at all the photos later to get excited for my own marathon, and to motivate myself to get here next year. I cheered for everyone from runners I knew, to runners I sort of knew of, to complete strangers with writing on their shirts. I discovered this wile spectating last year: even when you’re all alone, you never use the words “awkward,” or “embarrassing” in the context of cheering on runners in a race. Definitely not Boston. You scream your heart out against those metal barriers, all you want to do is make the runners hear you and keep going, maybe even smile. In my right hand I had my cowbell, and I was addicted to ringing it. 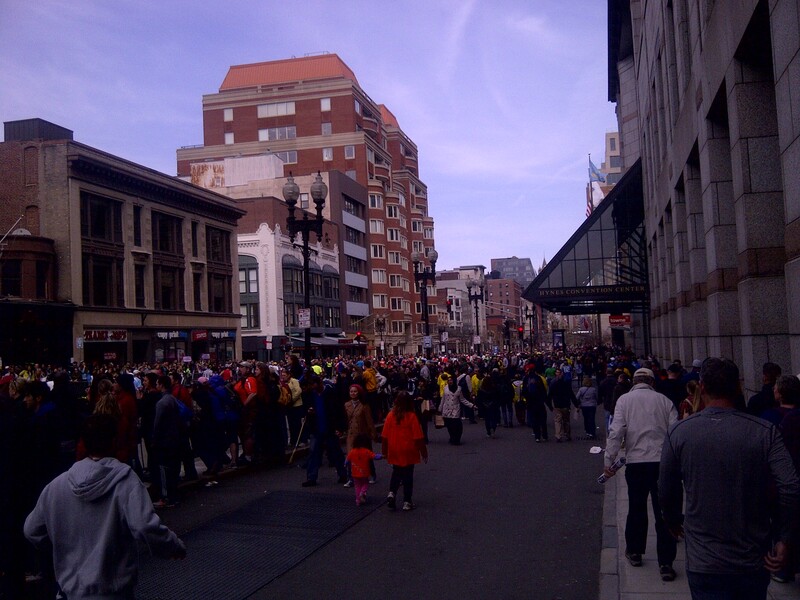 To supplying a small fraction of that energy found nowhere else but the streets of the Boston Marathon on Patriot’s Day. I eventually left my spot and headed back to the T, where I hopped on and rode with hundreds of other spectators (and eventually, Red Sox fans) back to the finish area. When we were almost back, I started discussing which stop at which to get off with a father who was with his kids. We were both aiming to get to the family meeting area; it seemed like he was meeting his wife there. Initially, he asked me, “Are you from here?” wondering if the Copley station was closed today (it was). We soon realized that it hardly mattered. Everyone was from Boston today; that is just what this city does to you on this particular Monday. Deciding on Hynes, we departed the train and I headed up Boylston through a packed crowd. 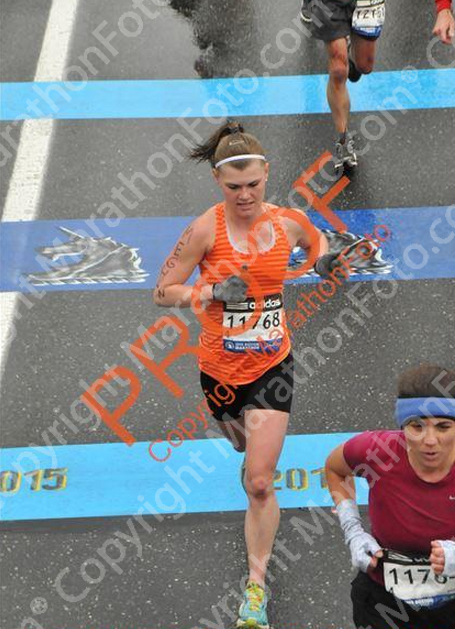 I called my aunt to congratulate her on her 3:30 finish, which was probably fifteen minutes before at that point. She likes to run marathons and then literally jump in the car and drive hours home – not my kind of post-race ritual, but on a day like this, I was very grateful she held true to this and was shortly thereafter ready to leave the meeting area. I asked where the car was, so I would know whether or not to get my bag at the hotel before seeing her. She told me she didn’t know, just go get my bag now, and hurry. So, I turned around and went back through the crowd, escaping down a side street to the Sheraton. 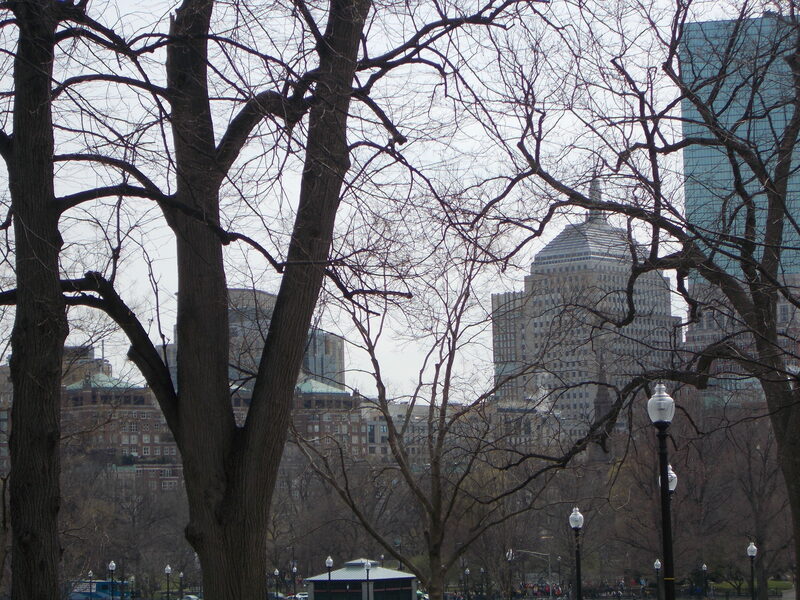 View from where I ran to, on the far side of the Common. My first glimpse of the smoke. couldn’t literally be a bomb. Then hoards of ambulances sped by in the direction of the sounds, and everyone began to really panic. Runners in mylar blankets who hadn’t met up with friends and family yet, and vice versa, started bursting into tears on every corner. People started hugging each other. I was numb, I didn’t know what was happening and couldn’t let myself think about what it was. What if it happened again? Right here in front of me? What if this is the last day of my life, and everyone’s lives around me? Is Boston getting bombed? Nothing really can describe that it is like to hear two bombs go off on a city street, especially when the second is louder and closer. 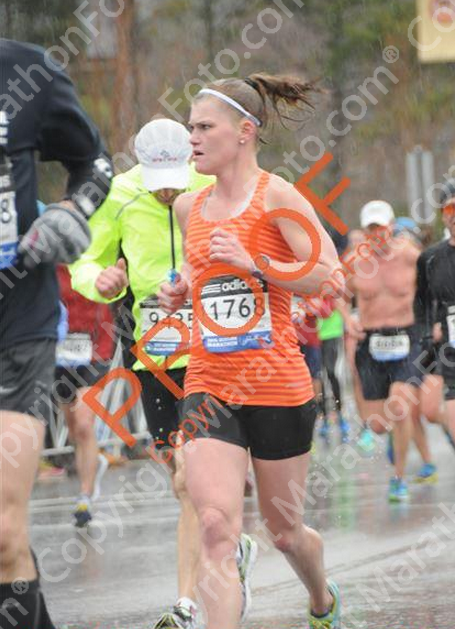 I threw the stupid umbrella against a building on the ground (sorry, Boston police) and continued running. I had called my mom right after my aunt, to let her know that if she “hears anything on the news,” I am okay. This was a good move, because in my phone’s typical fashion, it died right after. I heard someone say, “don’t go that way, there’s smoke.” That scared me. I found some quiet walkway and ran with my wheeled suitcase down it. I ran all through Boston Common. People looked at me running with my bags and seemed confused. Well, I was confused as to why they were playing catch? The next hour or so was a blur of stress and phone complications. Long story short: I did find my aunt, by staying put at the City Hall Starbucks and using a nice girl’s phone to call my mom to have her tell my aunt where to find me. Meanwhile, someone grabbed my aunt’s arm and told her to just leave the city, because they were closing the bridges and tunnels. When she panicked about not being able to find me, the man said, “I’ll help you find her!” Sure enough, the two of them did find me outside Starbucks, where the nice girl, Lucy, was staying with me until I found my aunt. We left Boston immediately and stayed in the car all the way until New Jersey, listening to the horror unfold on the car radio, calling people (except not me because my phone wouldn’t turn on…), and just staring blankly as the city of Boston grew smaller behind us. My aunt and me at the expo. What a great day turned so, so, so bad. I’ve had some time to process my thoughts, though I still am very disturbed and not quite myself. Initially, there was fear. Even at home in New Jersey. Fear that this kind of evil exists in the world. At the same time, giving in to fear is the worst thing we can do. Runners are unique in the sense that we don’t take fear as an option. If we let fear overcome us, we wouldn’t run. Runners are also special people because we are all friends. No, we might not become friends with every runner we meet, but when we pass each other on the street or on the trail, or run alongside one another in a race, there is this mutual understanding, this unspoken recognition, that we are friends. That we would help each other if we needed help. Comfort each other if we needed comforting. Hug each other if we needed a hug. This is just who we are and always have been. Rarely do you find such a large population of people sharing a common interest who don’t even need to campaign, rally, or organize anything to show their support for others; we simply need to come together, be together, run together. And just like that, the whole country is now running for Boston. It doesn’t make the horrific events of this long week any better in the least, but it somehow makes me believe I can find solace in the community I identify with most, the running community. Expo-ing: the verb, the skill, the sport. Most runners have experienced race expos dozens of times. Whether you are that person who is annoyed at the long lines to pick up your bib or that person who stops at every booth looking to score some good deals and sample products, the expo is a unique and ingenious creation. 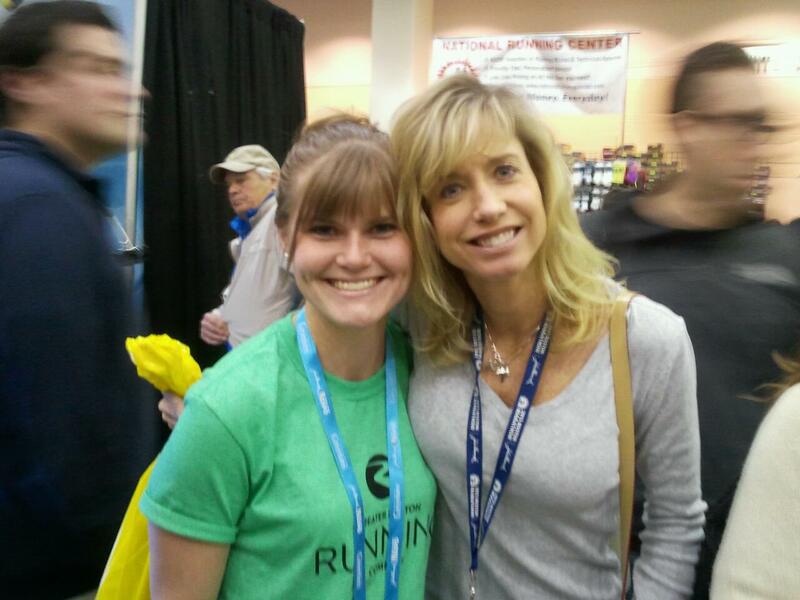 Being with the Running Company, we often reserve a booth at expos and partner with a vendor or two (or seven…) so we can gain experience selling products we sell in our stores. When I hear of a chance to work at an expo, I jump on it. Actually, when it came to Boston, I’m pretty sure I sent an email about it two months before anyone actually asked who wanted to work…needless to say, they let me. 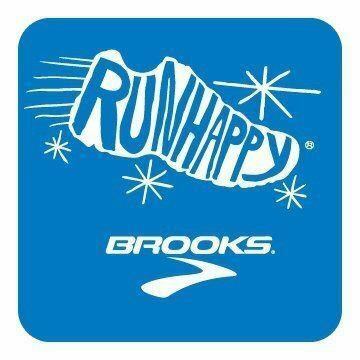 The Boston Marathon expo was my first big expo, attended or staffed. 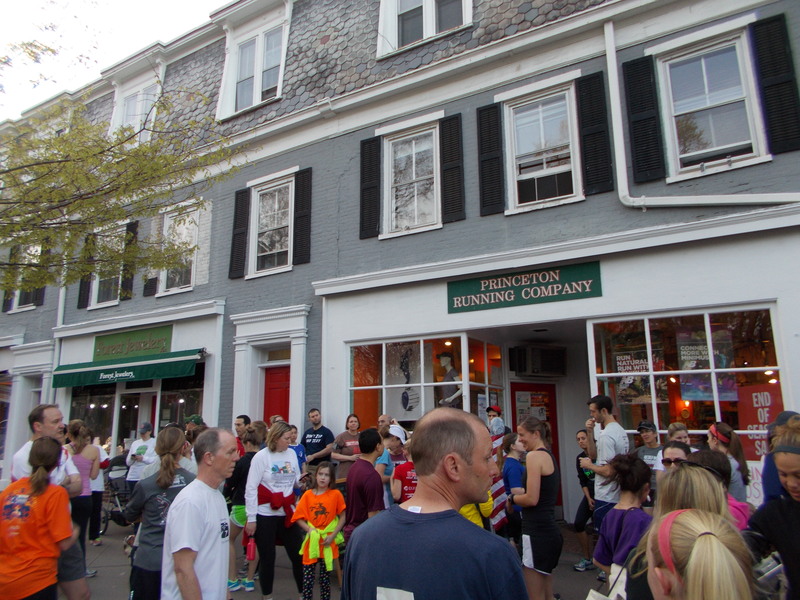 I called it “runnerd heaven,” and was in a state of euphoria for the first two days. Until, you know, I lost my voice and my calves had swelled an extra half inch (exaggeration). It was such a great experience, and I want to expand on it in its own post later. I more recently worked at the New York City Marathon expo, which ended up being about twice as fun. 7 AM: leave in the truck/van/car for the destination city. Car ride of x hours later: Arrive at expo venue. 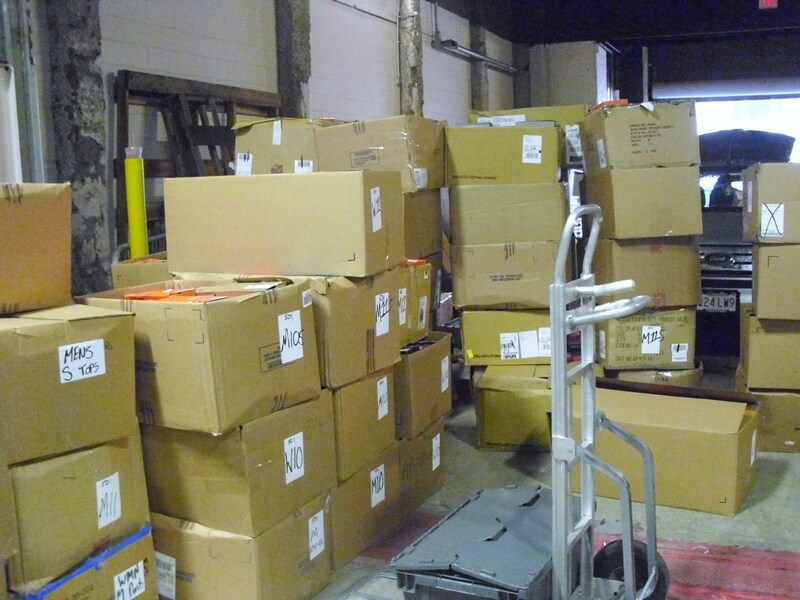 Unload truck/van immediately, and begin booth setup. 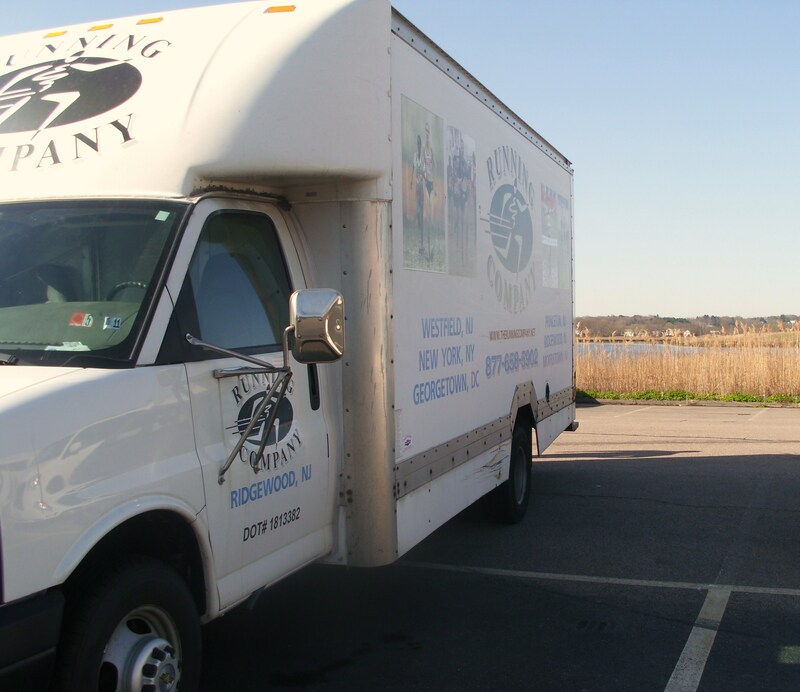 This may involve heavy lifting, pushing, and navigating poorly loaded contraptions on wheels great distances. It also may involve assembling a metal shelf system from probably 1985. 8 or 9 PM: Hotel check-in and dinner, in either order. The food at this meal is always amazing, and you always look sub-par (setup is sweaty). 10 PM: Return to hotel, mentally prepare for the exhausting and fun day ahead. 10:30 PM: Decide that you might as well go out and explore! 1:30 AM: Decide you went to a bar entirely too far away! Return to hotel, pass out. 5 AM: Wake up. Drag yourself out of the hotel for a run before the madness begins. 8 AM – 7 PM: Work at the expo! At some point, make note of all the booths you may want to buy things from…before they sell out of what you want. At another point entirely too late in the day, get lunch and chug water. 7 PM: Dinner! 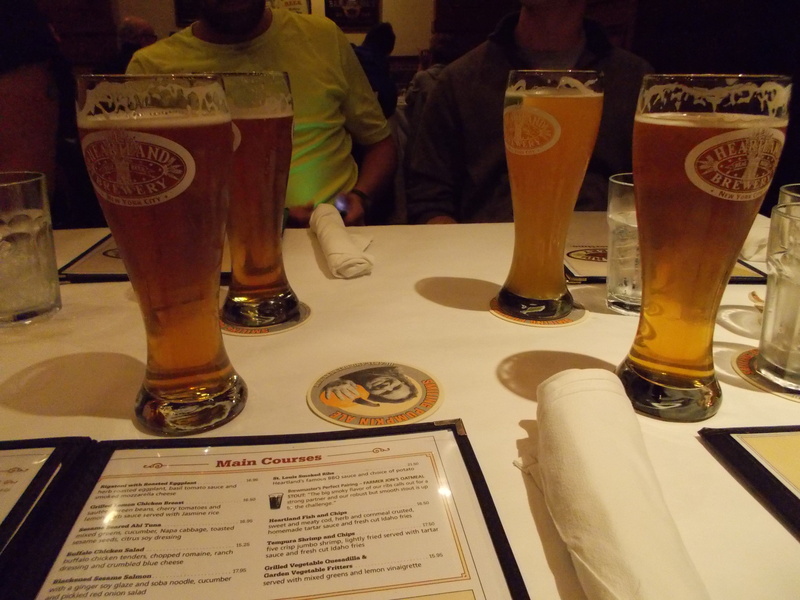 Multiple beers on the tab, since you are not paying for them! 2 AM: Return to hotel, organize, drink water, SLEEP. 8 AM – 7 PM: Expo! You are a little more tired than you were the day before. 8 AM – 7 PM: Expo and BOOTH BREAKDOWN: see day one for level of strenuousness required. Run, and watch the race! * You almost feel like you’re running it yourself, you’re so tired. *that is, if the race actually happens. Author Meghan @ Shoe StoriesPosted on February 6, 2013 February 6, 2013 Tags Boston, expo, NYCLeave a comment on Expo-ing: the verb, the skill, the sport.